All guests are required to leave their room by 11am. Late check-outs are possible subject to a charge and availability. Please enquire at check-in or during your stay. Late check-outs will be charged as follows: 2pm £20, 5pm £40. Breakfast is available from 7am until 10am on Monday, 7am until 9am Tuesday to Friday and 8am until 10am at weekends and bank holidays in The Brasserie downstairs. Your breakfast consists of both Continental breakfast items and prepared-to-order cooked breakfast. Orders are taken in the breakfast room each morning – there is no need to place your order in advance. Please allow approximately 20 minutes for service, as all items are cooked fresh to order. These times apply to all guest including diners and residents. We do not operate a 24-hour residents licence. Night porter services are provided 7 days a week. Should you require any assistance during the night, the night porter can be found on the ground floor in the public areas. Should you require the use of a facsimile, photocopying facility or any other business service, while we do not publish a set price list for these services our reception staff will provide a quotation on request. The heating and cooling in your room is provided by either air-conditioning or radiators. Instructions for the air-conditioning system are adjacent to your remote control. Thermostatic controls are provided on all radiators for individual temperature control. Our loft rooms have Velux roof windows. These are opened with the use of a pole provided in your room. Simply attach the hook to the top bar of the window and pull down. Please note these windows should be closed when leaving your room. If staying for more than one night your room will be refreshed rather than completely changed as standard. Should you require additional service please contact reception. If ironing equipment is not available in your room please contact reception. Please consider other guests and return equipment or advise a member of staff when you have finished with the equipment. Standard terrestrial channels plus a number of digital freeview channels are available in all rooms. In our lounges a comprehensive satellite service is available, including Sky Sports. If an external telephone service is required, please contact reception for assistance. During busy periods we cannot always guarantee car parking spaces will be available for all of our guests. There are two convenient car parks within easy access of the hotel – details of which can be found overleaf. Please do not park in The Landsdown Club car park next to the hotel unless specifically directed to do so. There are two easily accessible pay and display car parks within close proximity to the hotel, one situated at Luton train station and the other directly opposite the hotel on Telford Way. On the map below both car parks and the driving routes to find them are indicated. 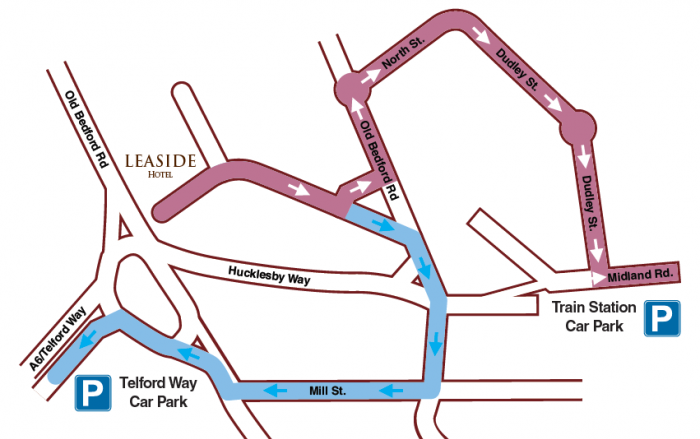 The pink route leads to the Train Station car park and the blue route leads to Telford Way car park. An outdoor parking facility situated just the other side of the railway bridge to the front aspect of the hotel. The return journey to the hotel will take just a few minutes on foot. This is a 24-hour gate-secured multi-storey parking facility. The return journey to the hotel will take just five minutes on foot. If you would like to discuss the parking availability and alternative options with us prior to your event please contact reception on 01582 417643.